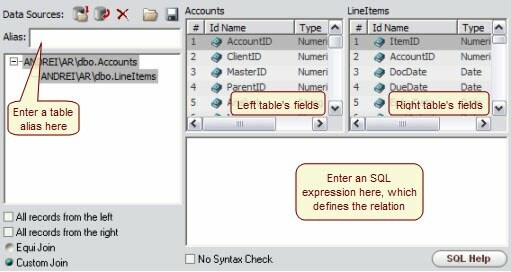 The Input Data Source provides a way to connect to an existing database resource such as a table, a view, or a stored procedure. Click on the Open Data Source button ( ) to launch the Database connectivity dialog to select a data source. The number of records, if available, will be displayed for your convenience. You can browse the content of the selected data source by pressing the Browse button ( ). Your task of setting up a database connection has been accomplished. Now you may want to create a dynamic view using multiple resources from available data sources. The Dynamic view is for joining together several data sources. These data sources can be located on different database systems. Dynamic views produce a composite record set that contains all fields from the linked data sources. The dynamic view is constructed using the dynamic view designer. 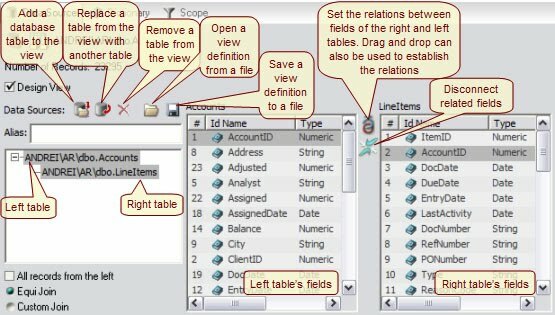 Select the "Design View" check box on the Data Source tab to use a dynamic view and uncheck the box to use only the root data source. 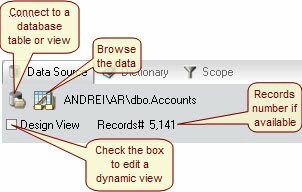 Use the Add Data Source button ( ) to add, the Replace Data Source button ( ) to replace and the Remove Data Source button ( ) to remove data sources from the dynamic view. For each pair of selected data sources, the two field lists will show their respective fields. With Equi Join, you can visually link two tables. You can drag a field from the left field list and drop it onto another field from the right field list to establish a link or you can select two fields from the different field lists and click the Connect button ( ) to connect. Use the Disconnect button ( ) to disconnect connected fields. All linked tables are joined using the equal (=) condition for the connected fields. The "All records from the left" check box is an additional option for the equi join mode. When checked, all the rows from the left table appear in the output regardless of whether there is a corresponding row the right table. For such records, the values for columns from the right table appear as null. The Custom Join mode allows for arbitrary join expressions. The "All records from the right" option specifies that all the rows from the right table appear in the output, even if there are no corresponding matches in the left table. Columns with no matching data in the left table appear as null.